When the artist Wilfredo Prieto exhibited his by now unforgettable half full or half empty glass of water in Madrid, he managed to leave fifty percent of his viewers astounded and the other fifty percent thirsty. This happened a bit more than a year ago and it will be talked about for a long time. The reason why it will continue to generate public opinion is that more than a daring or provocative proposition, it was primarily a very simple one, which was as transparent as the glass or the water it contained, elementary like most of his work. Tagged with a price of 20,000 Euros, it was initially about to be bought by someone who reserved the piece and at the last minute reneged on their enthusiasm. What could have caused that potential buyer to get cold feet about their desire to take home a half-filled glass of water? I guess we shall never know the answer to that question, but at least once, since its conception in 2006, a buyer has been seriously interested in acquiring it. That was the year the artist exhibited the piece called “Grease, Soap and Banana” in a gallery at the Santa Clara Convent. 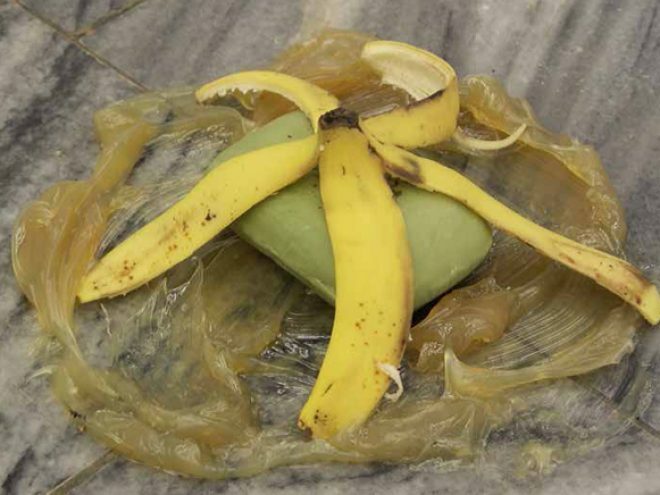 Once again, only crude reality composed his creation: a banana, a bar of soap and grease spilling out over the floor. Nothing else, except for the comings and goings of the waiters as they carried in the delicious buffet to the numerous guests. This artist, born in 1978 in Zaza del Medio, Sancti Spíritus Province, has defined himself as a “realist” since he aims to find contents which are already contained in reality. He works with unadulterated reality, thereby avoiding the possibility of some trademark identifying the creations as his own. Perhaps that’s where one of his critics’ weakest arguments come from: the notion that “anyone could have done it.” Of course, they are forgetting something obvious: maybe anyone could have done it, but it was not just anyone, it was simply Wilfredo Prieto. The bad press his glass of water received dissolves in an instant when, returning to what his detractors have written about him, we realize that nine times out of ten the criticism centered not on the idea or form or concept being formulated by Prieto with that half-filled glass but on the sale price. Reducing Prieto’s concept to just a glass containing water, stripping it of any idea or reflection about it, would be akin to trying to reduce Wifredo Lam’s The Jungle to mere kraft paper and charcoal. Prieto belongs to a generation that uses everything, whatever he has close at hand, and that’s not much, other than the sudden discovery that the world is a wide, foreign space. A generation born between two centuries and raised in an era where walls were falling and symbols became banalities and who have this viewpoint about everything. Nothing is that important and nothing lasts. Only the here and now counts in a world that is changing at the rate of over twenty-four times per second, and they seem to be doing well with it. His work—perhaps even in spite of himself—present us with a portrait of such a world and seem to be made to measure. They are like those selfies where the protagonists lose their value, dissolving and becoming nothing in the sight of all the generalized disaster that seeps into the picture. Neither good nor bad—criteria that are useless when applied to such a phenomenon—it is a sure thing that the marks Prieto is leaving in his wake will remain there, bearing witness to an era and a lifestyle where a glass half-filled with water can cost 20,000 Euros, although nobody has bought it.